In November 1993, my wife and I began receiving phone calls from at least two chiropractic offices urging us to come for a free chiropractic evaluation. At first we ignored these calls, but when they persisted I realized that they presented me with a remarkable opportunity. Although I had investigated chiropractors for many years, I had never been to one for a complete examination. The chiropractors involved worked in a chain of "family health" clinics. Since they (or their telemarketers) did not appear to know who I was, I decided that it might be possible for me to experience what these chiropractors normally do with new patients. As far as I can tell, I did. The chiropractor's office was composed of four rooms. The main room, about 20 x 40 feet, included a business section behind a low wall, a play area behind a low wall, chairs along one wall, two treatment tables in the center, and five benches for kneeling. Toward the rear were two small rooms used for examinations and a third room for taking x-rays. The walls were decorated with posters depicting the autonomic system and the spine. One poster stated: "Subluxation - The Silent Killer - Chiropractors Correct Subluxations." Pamphlets relating subluxations to disease were displayed in two racks. Except for not mentioning that I was a psychiatrist, I said or did nothing deceptive. Upon arrival, I was asked to fill out a registration forms, a health history form, and a form for diagramming any areas of pain that I had. I indicated on the form that I had come primarily for a check-up but had been experiencing some dizziness and fullness in one ear for a few days. (This statement was true. The cause was vestibulitis, a viral inflammation of the inner ear that had been medically diagnosed and was gradually resolving.) Regarding my health history, I indicated that I had had coronary bypass surgery four years previously. For occupation, I listed "journalist." The chiropractor, whom I shall refer to as "Dr. Y," greeted me pleasantly and led me to one of the small examining rooms. Noting that I had not had chiropractic care previously, he began by explaining the basis of chiropractic and how subluxations could cause a large number of health problems. He used a model of a spine to illustrate how the spine was curved and what this supposedly meant. He explained that his office layout was an "open system" that enabled patients to see and hear each other being treated. He said that this also enabled patients who were waiting to see why they were kept waiting. He then reviewed my history, asking questions and making comments about how various things might relate to the spine and subluxations. He asked several questions about previous accidents and falls, indicating that small trauma might not cause immediate problems but might set people up for future problems. He asked a few questions about my dizziness, including whether I had had trouble hearing, but he did not appear to make anything out of what I replied. I mentioned that I had vomited twice after the dizziness began, but he did not explore this problem further. He then examined the range of motion (flexibility) of my neck, back, spine, and legs. He measured me on a Spinal Analysis Machine (S.A.M.) and stated that I appeared to be ten pounds heavier on my left side than on my right. S.A.M. is a screening device with two scales built into its base. The person being tested stands with one foot on each scale while the chiropractor makes various observations about the weight readings and the individual's posture. Dr. Y related his observations to spinal curvature and hip rotation (which I do not believe I have) and noted that I tended to carry my head forward (which I do). On the way out, I asked Dr. Y about his background and learned that he had graduated from Sherman College of Straight Chiropractic, had practiced in another city for about three years, and had been recruited for this clinic about six months previously. He said that the facility was part of a chain of straight chiropractors, explaining that they only did treatment with their hands. He said this was a second career for him, that he had previously been a yacht captain. During my first visit, Dr. Y did not appear to recognize that my symptoms were caused by a problem within the ear. He said nothing to indicate that my ear problem could have been a symptom of an infection, Meniere's disease, or possibly a tumor of the brain or ear. He did not check whether my eyes had abnormal back-and-forth movements (nystagmus) or examine my ears. He did not ask whether I experience ringing in my ears. He did not mention my bypass surgery. He did not examine or inquire about the current status of my heart. His "neurological exam" did not include testing of my cranial nerves (the nerves that originate in the brain and go to various organs in the upper part of the body). He did not examine the function of my cerebellum, the part of my brain that controls coordination. These tests are part of a standard neurological examination and had special relevance to my reported symptoms. He examined me fully clothed. This visit lasted half an hour, during which Dr. Y said: (1) my neurological and orthopedic examinations had few findings except for some restriction of motion when bending over (this was an accurate observation); (2) my neck had restricted motion (true, but not a health problem); (3) one shoulder was elevated (true, but not a health problem); (4) the left side of my body weighed more than the right side (not true, but not significant anyway), and (5) since these findings indicated "possible subluxations," he had obtained the neck x-rays. 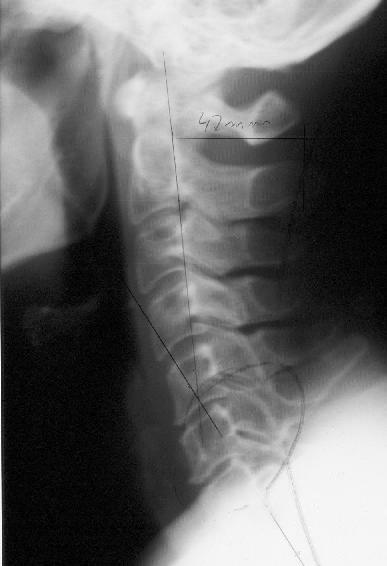 He then compared my x-ray films with a "normal" film that showed considerable curvature of cervical spine. According to him, mine showed a 41% decrease in curvature. Pointing to the bones at the base of my neck, he said that the two lowest ones were slightly overlapped. He said this was a "subluxation" that could influence nerves going through the area and be a factor in my dizziness. When I asked how that could happen, he replied that cranial nerves have small branches that enter the neck and go back up to the head. When I asked where he thought the problem causing my dizziness was located, he said he didn't know, but he rattled off a list of possible conditions that included infection of the inner ear and a problem with the vestibular canals. His list was fascinating to me because: (1) it was correct; (2) neither his history nor his physical examination had delved into most of these possibilities; and (3) he did not appear to have taken any of these possibilities into account when he formulated his treatment plan. When I asked whether it mattered which it was, he replied that it did not because the nerve interference could cause any of these things, and that he would treat the nerve interference. He said that the fact that I had had no prior symptoms means that treating the problem may not be urgent, but the dizziness might be the first indication of trouble. I might get along all right without treatment -- perhaps for ten years -- but his treatment could prevent the progression of arthritis. The spaces between the vertebral segments are normal. There are no signs of bony degeneration. No "subluxation" or any other risk to the integrity of my spinal nerves is visible. The curvature is less than average, but is not abnormal. There is no medical reason to be concerned that this will cause trouble. Dr. Y did not suggest -- as would have been medically proper -- that I undergo further tests with an ear, nose, and throat specialist to be sure that my symptoms were not the result of a brain tumor or other problem that, if overlooked and neglected, could have disastrous consequences. Instead, he recommended chiropractic treatment to increase the curvature of my neck. He proposed that we begin daily and gradually go down to one or two treatments a week -- for a total of about 40 visits during the first three months. This, he said, might reduce the lack of curvature by 22%, after which he would reassess the situation and make further recommendations. He said that his usual fee for these services was $32 for the visit, plus additional fees for traction and ice packs, etc., with a total of $75 to $90 per visit. Between my first and second visits, Dr. Y's staff had telephoned my insurance company to find out the extent of coverage for chiropractic services. "Your insurance is a bit unusual," he told me. You have a total deductible of $700, but they wouldn't tell me how much you already had credited." Dr. Y said that since the end of the year was near, his fees would be less than the amount of my deductible. He explained that the cost of his treatment for the remainder of 1993 (about $500) would not be covered by my insurance, and, in 1994, the insurance would not kick in until I had paid the first $700 of fees in 1994. Saying that this was a lot of money, he would be willing to accept $500 in 1993 and $200 in 1994 and waive the remaining deductible ($500) for 1994. In other words, my out-of-pocket cost would be $700 instead of $1,200. Routine waiver of the deductible amounts is a form of insurance fraud and is illegal. Dr. Y told me to think about his proposed plan and that it was not his practice to pressure people. His office made no further attempt to recruit me as a patient. After solicitation by a telemarketer, I visited Dr. Y for a free checkup. As described above, he: (1) failed to take a complete history, (2) failed to perform a proper physical examination, (3) took x-rays unrelated to my symptoms, (4) misinterpreted the x-ray films, (5) failed to appropriately diagnose my ear problem, (6) failed to suggest that I seek medical attention for what could be a serious problem, (7) recommended treatment for a condition that -- if it existed -- did not bother me, (8) proposed a highly questionable treatment plan, (9) inappropriately advised me that treatment was needed to avoid future trouble, and (10) suggested a fee arrangement that would have been illegal. Sherman College of Straight Chiropractic teaches that the foundation of chiropractic is "correcting subluxations that interfere with the body's innate strivings to maintain its health." A brochure I picked up at a school display in 1995 states: "At Sherman College, you learn highly sophisticated methods of locating analyzing, and correcting vertebral misalignments which interfere with the nervous system." The school's philosophy -- as exhibited by Dr. Y -- considers medical diagnosis irrelevant to chiropractic practice. Some chiropractors refer to this viewpoint as the "super-straight" philosophy. Somewhere between 2% and 4% of chiropractors belong to organizations that espouse this philosophy -- which the majority of chiropractors consider extreme. (That translates to one or two thousand in the United States.) However, the percentage of chiropractors who encourage large numbers of visits to correct "subluxations" is much higher and may be a majority.